1. **Long finger nails** – Apparently, pregnancy hormones can increase growth in your nails. Nice! My nails are so flimsy that they break easily and then I have short boyish nails for a while. They still break a lot, but now they grow back so fast I only have short or uneven nails for a couple days. Of course, I don’t enjoy the extra maintenance involved in trimming my toenails, especially since it’s tough to reach them, but it’s worth it if I finally get to have girly hands. 2. **Hair** – Again, thank you pregnancy hormones. I can’t really say for sure that my hair is fuller, but man does it look pretty. So either it really is fuller and healthier or the hormones actually have the effect of making me delusional. Either way, I’m happy. 3. **Feeling less guilty about taking care of myself** – This one probably shouldn’t be on this list. I should never feel guilty about taking care of myself, but I do. I also know that if I continue to take care of myself after the birth, I’ll be creating a healthier environment for our baby and I’ll be better able to attend to others’ needs when I’m needed. Therefore, I’ll miss having an obvious physical reason for taking care of myself, but I’m also going to work every day to remember that I don’t need an excuse to address my own needs. 4. **People being nice and offering help** – When I was at Costco the other day a woman saw me filling my car’s tires with air and asked if I wanted her to do it for me because I had a bundle up front. I didn’t need help at the moment since I was using it as an opportunity to practice squatting, but it was so nice of her to offer. Sometimes it can be a little embarrassing when people offer to help, but it’s so heart-warming and builds my faith in random strangers. 5. **Ultrasounds** – It’s like we get to spy on the baby when he thinks we’re not looking. That’s right, little dude, we saw your hand on your diddle. You didn’t know you were being filmed, huh? We even have video that we can use to embarrass you at your wedding. We’re gonna be great parents. 6. **Always knowing where my kid is** – Right now, I have a decent amount of control over his safety. I know where he is at all times, he can’t run out into traffic, and I can step into the other room without worrying what he’ll get into because he has to come with me. Thinking about trying to keep track of a toddler is scary. 7. **No crying or fussing** – Sure, sometimes he can get pretty squirmy, but I’m still able to sleep through it. It’s easy to provide for his needs when the umbilical cord takes care of most of them automatically. Learning to decipher his cries could be tricky. Good thing Dante has been helping me practice for years by bombarding me with inscrutable meows. 8. **Being told I’m a superhero for doing the most basic things** – My yoga instructor told me last week that I’m a trooper for being there during week 36. I felt awesome even though I didn’t really feel like it required that much effort on my part. I get the general sense that people think it’s great that I’m up walking around. Maybe there are too many horror stories floating around that imply being pregnant equals months of pain and misery. I do feel lucky that I’m not on bed rest and that my many aches are manageable. 9. **The anticipation** – He’s been hanging out with me for months, but I have very little idea what he looks like and almost no clue as to his personality. I’ll be happy to find out, but I’ll miss that excitement that comes before opening the present. 10. 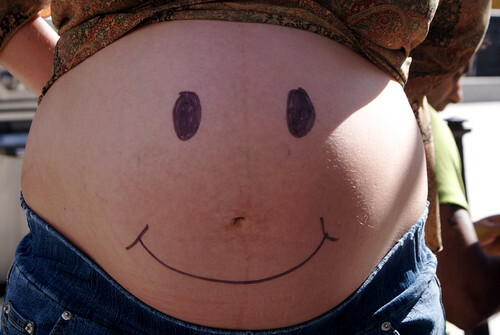 **Having a cute belly that makes people smile** – See above photo. * **Peeing in a cup before every doctor’s appointment** – There are a lot of them! Making Dave do all the work? he, eh? so I guess the secret’s out? Well, that’s all. I’m out!